A really simple CAS design for the CAS Challenge at Splitcoast this week. Our challenge….use postage…be it stamps, die cuts etc. And this card is also for The Paper Players Challenge 127 – Love Is In the Air. Although I can’t get it to photograph properly, there is a faint watermark image on the black card base. I used a TCW heart template and sponged on Versamark and then dried it with my heat gun. It’s really subtle but adds some oomph to the back ground. Next, I use a Spellbinder’s die to cut the postage stamp and while it was still in the die, used the same template and sponged the hearts in three shades of red ink. Then the background was sponged with Spun Sugar Distress Ink. Next, I stamped the little lips in the darkest of the red inks. The sentiment was stamped in black ink and then for a little pizzazz…I used my Gelly Roll pen to add some shine to the lips so it looks like lip gloss. Fun hmm? The postage stamp die cut has been popped up on dimensionals when added to the card base. This is adorable! What a fun way to use the challenge to make a card that is perfect for Valentine's Day. The Gelly Roll “lip gloss” is the perfect touch! What a FANTASTIC card you created – LOVE it! Oh my gosh…this is just too cute! 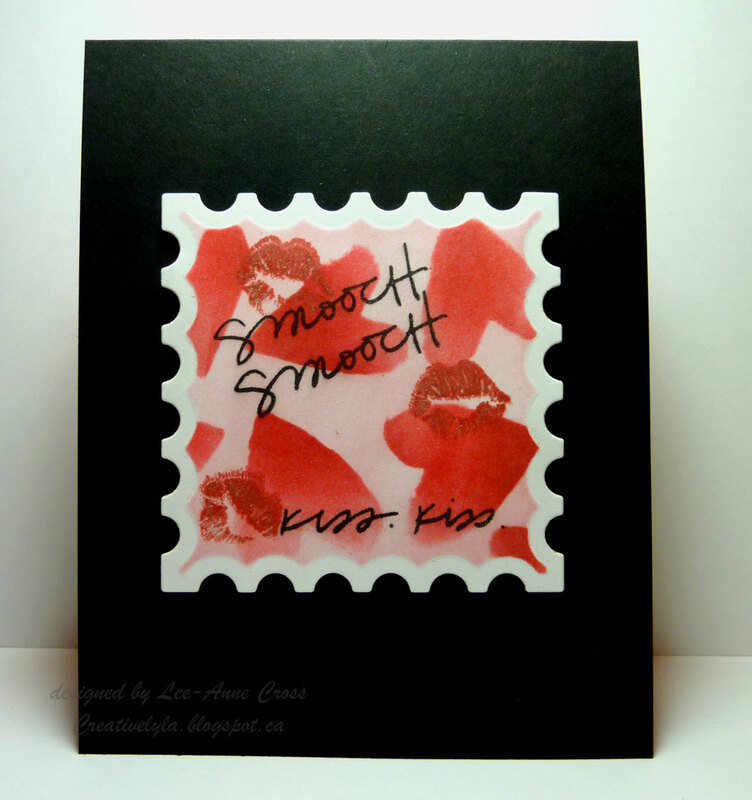 I LOVE the “smoochied” postage stamp. Thanks for playing with The Paper Players this week! So cute! Love the simplicity of the red and black. Thanks for playing with The Paper Players this week.